It all started once upon a time…probably when I was in college…I wanted to get a tattoo but didn’t know what to get. I’d often fall asleep at night, imagining what I’d get tattooed on my body- and where. That went on for years but I never did anything about it. Back in October 2013, I started looking around for tattoo artists and found Corey Clark at High Caliber Tattoo. 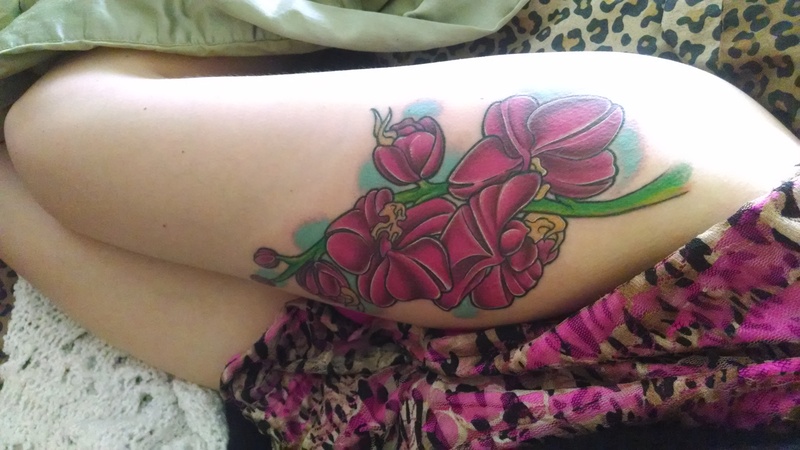 I had been staring at orchids since before October and knew I wanted him to draw them on me. I went in to talk to him and had him design the tattoo. A couple of weeks later he was working on the outline. 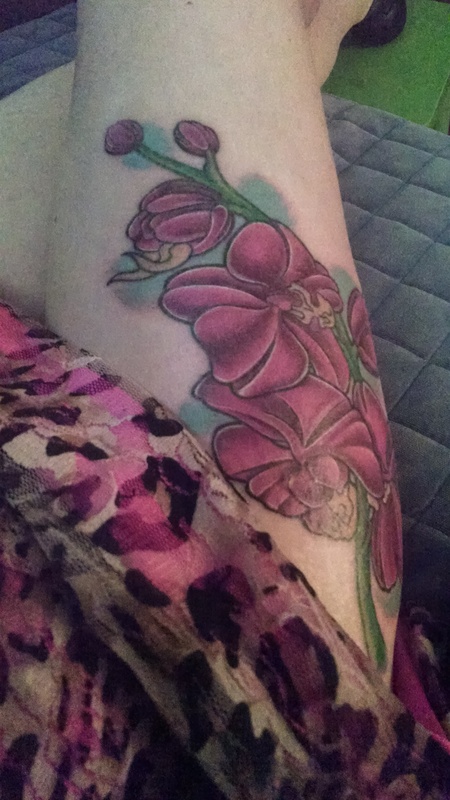 The next, I had the outline all done and my only concern was to keep it clean and moisturized as it healed. This was day 1. The outline was fresh and I was sore but it was worth it! It was perfect! For a week and a half to two weeks, I was smitten with the outline and I thought that’s all I wanted. It was beautiful. I showed the kids and they thought it was perfect just as the outline. So, I started taking pictures of the outline like there was no tomorrow. My kids (and I’m looking at my pink loving daughter right now) had no idea it was going to be a beautiful color bomb once it was colored in and while, at first, I loved the outline just as it was… one day, I realized I really wanted that color and I noticed how the line work was all nice and healed and I was mentally ready for more needling. The line work took about an hour an a half and I did just fine. It felt warm but didn’t hurt, per se. Corey and I sang along to The Police and talked about life. He’s a totally nice guy besides being awesome at his craft. I knew I’d be fine under his care. Finally, the day came for color work. I couldn’t have been more excited. It took 3 hours of me being absolutely still! And, honestly, it was only the last 30 minutes that really burned. I twitched (involuntarily) twice but that was toward the end and it didn’t happen again. I’ll go back once I’m all healed up for touch ups. But look at this beauty! Below left is a pic while still at the tattoo place. You can see Corey’s arm with his black gloves, dabbing my leg as he works. When he was done, he put plastic wrap around my leg. One thing I couldn’t have anticipated was how tired and hungry I’d be after getting the color done! The next day, while I waited for the kids to get home, I took a load of photos. I love how my tattoo goes so well with my leopard print Gunmetal. Later that day, I took the kids to get sushi and I got a great shot while sitting in the car, waiting for the sushi restaurant to open for lunch. You can see a bit of bruising around around the blue shading. The color kept looking better and better with each photo I took! Especially in the lovely light in my bedroom! You can especially see how raised my thigh is in this photo below. 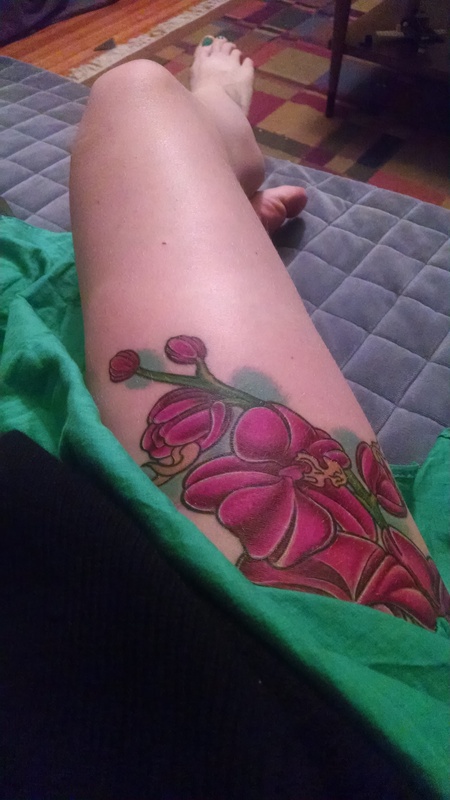 The swelling is all down and there are only a couple of places that still need to heal but it’s looking nice. 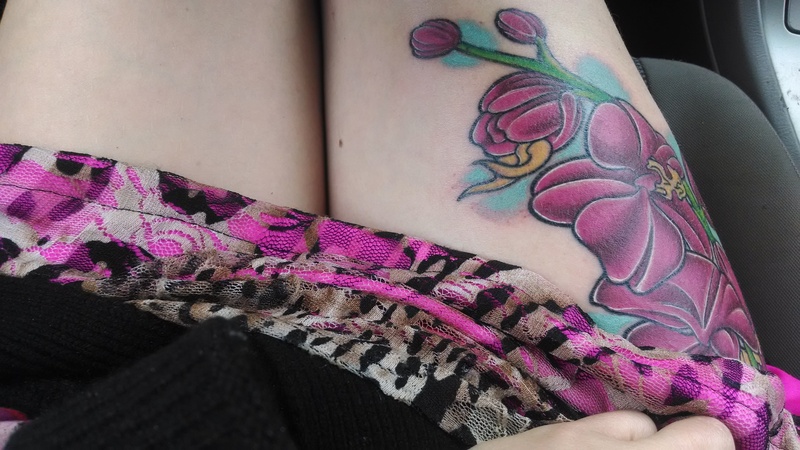 And how cool that most all my clothes are matching my new tattoo! Some photos show the color saturation more than others. 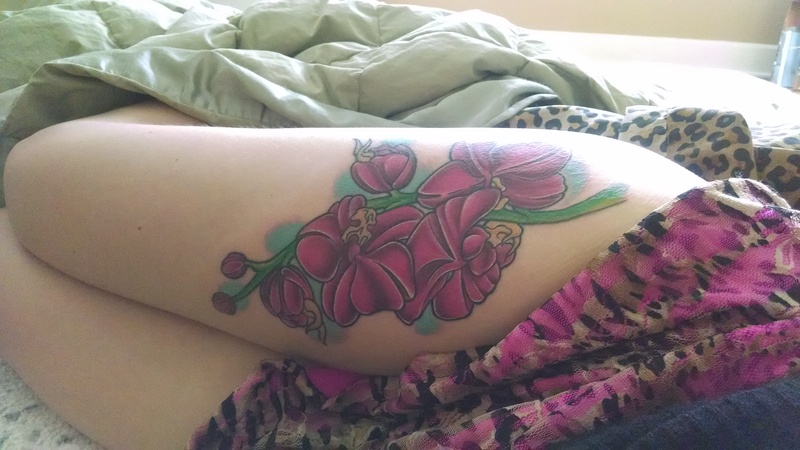 Over all, it’s a hard tattoo to photograph because it wraps around my thigh….which is why I need to take so many photos!! And then it started peeling… and as much as I tried to keep it moisturized, it still peeled. It itched a little bit but not that much. 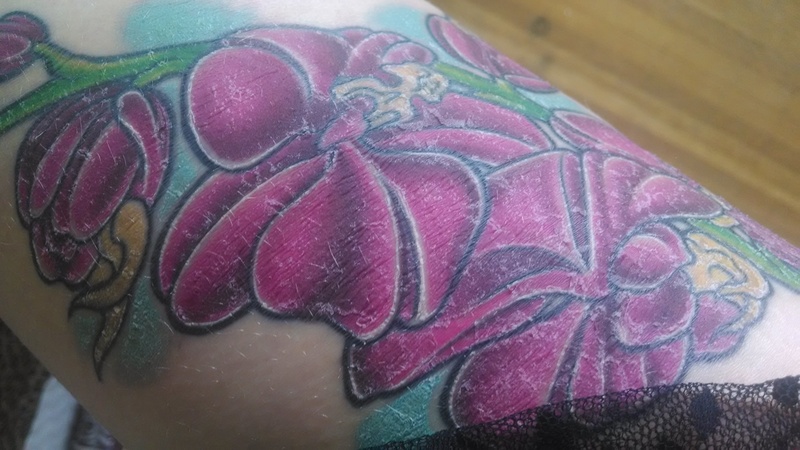 Since I’m still home during the day with my kids, I was able to air dry the tattoo after washing and I could moisturize throughout the day easily. 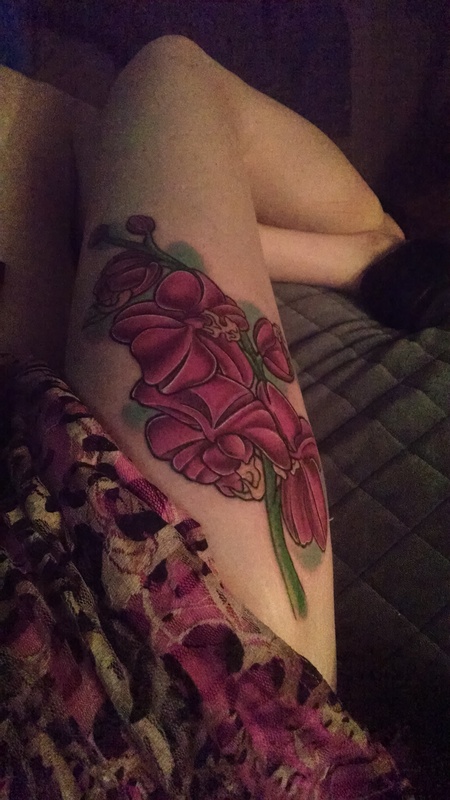 And rather quickly, the bruising went away and now, about a week and a half later, I see no bruising and things are looking quite gorgeous! 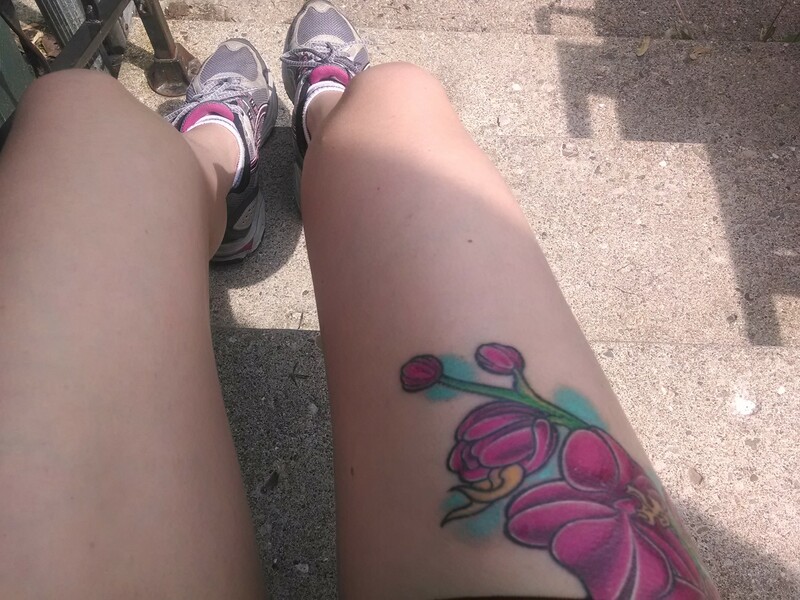 I even started jogging again. There you have it. My first tattoo. I’m super happy with it and I like showing pictures (see above) whenever I get a chance. Now I’m off to bed so I can wake up early, wear black pants and a black top for work and weep at the fact that I don’t get to see my tattoo until I get off my shift. It is absolutely gorgeous Leila! My first tattoo (on my foot and ankle) hurt like the dickens! But I did not want to cry out or move so I just kept squeezing my arm. The next day my ARMS were bruised! But I love it! Stars to represent each of my kids in a swoosh of color… Yours is amazingly beautiful! A beautiful tattoo for a beautiful lady! 🙂 Enjoy! What a great tattoo story! Brought back lots of great memories of watching Jamie get his shoulder done. It’s such an exciting feeling to take that step of permanent ink! Ahh it’s so pretty! I’m getting my first in less than two weeks, a bee between my shoulder blades… I hope it goes as well as it went for you! Don’t worry its supposed to peel! heavy scabs happen occasionally which isn’t as good a heal but still turn out ok. light peeling is perfect! congratulations! I LOVE it Leila!!! Super gorgeous!!! That is a beautiful color! And you have nice leg. I’d hike my skirts up if I had legs like that even w/o a tattoo. This is a great tattoo, especially for your first. Yay you! What a beautiful tattoo. My daughters and I have matching tattoos on our feet (astrological signs intermingled) and they hurt like heck but in the end it was worth it. I can’t imagine going back to add any color to them, you are a brave woman! I love that tattoo. It looks amazing. Getting it coloured was a great idea.